Healthed, one of Australia’s leading online resources for health professionals, has published an informative and concise article on androgen deficiency in women. Androgen deficiency is otherwise known as low testosterone. This is an exciting step in raising awareness for a condition often overlooked by medical professionals. The article, written by endocrinologist and androgen researcher Dr. Sonia Davison, can be read here. Unfortunately, low testosterone in women is an issue largely ignored by mainstream medicine. Most General Practitioners and Physicians receive very little, if any, training in female hormones. This is despite the fact hormones play such an integral role in women’s health, particularly in the age of menopause. As such, when a widely read health resource publicizes low testosterone in women it signifies a win for this oft-ignored condition. A Hormone Solutions product, AndroFeme testosterone cream for women, is mentioned in the article in regards to treatments for androgen deficiency. Ensure adequate oestrogen +/- progestogen. Use a testosterone implant (50–100 mg placed subdermally 6 monthly. Unfortunately, this product has been discontinued but an alternative implant is being sought). Dr. Davison is a consultant endocrinologist at the Jean Hailes Foundation. The Jean Hailes website is an excellent resource for women’s health and contains a plethora of valuable information. Let’s hope this Healthed newsletter is the start of much more recognition for a condition suffered by many women, often in silence. 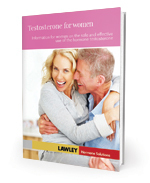 To read more about testosterone in women, click on the booklet below.